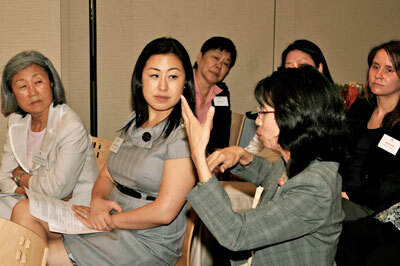 Since 2008, the Federation has been bringing together local Asian family foundations aimed to share experiences, learn about philanthropic practices and address pressing concerns for the Asian American community. On June 27, 2011, the Federation broadened our scope to engage more funders, and hosted, in partnership with the Ong Family Foundation, C. J. Huang Foundation and JPMorgan Chase Foundation, an Asian Foundations & Funders Reception with new participants: the Morgan Stanley Foundation, Taproot Foundation, Korean American Community Foundation, Beautiful Foundation USA and New York Community Trust. A topic of focus was the recent Federation coordinated initiative, Project Speak Out!, where the Robert Wood Johnson Foundation matched funds raised by the Federation and local Asian funders for a citywide domestic violence prevention campaign in collaboration with four domestic violence agencies. The Federation and co-hosts aim to build on this model and hope to launch the concept of an Asian Funders Collaborative in leveraging resources together to make larger impact for our community, much like how Project Speak Out! did for domestic violence shelters and programs. Nelson Louis, Executive Officer of the Ong Family Foundation, spoke about the importance of uniting funding for multi-year and multi-pronged programs, and the deeper impact a collaborative can make. Paul D. C. Huang, President of the C. J. Huang Foundation, gave an overview of emerging issues in the Asian American community citing that Asian Americans comprise 13% of the cityís population but only receive .4% of foundation funding. Cao O, Executive Director of the Federation, and Leticia Peguero, Deputy Director at the Robert Wood Johnson Foundation, discussed the successes and challenges of the Project Speak Out model and how it could be replicated by others to achieve an efficient funding mechanism. 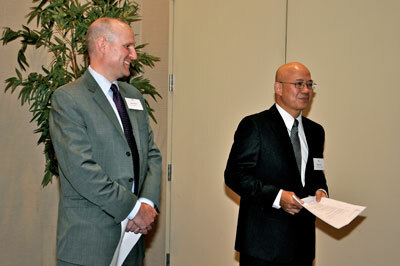 Co-hosts of the reception, Mark Rigdon (left), of JPMorgan Chase Foundation, and Nelson Louis (right), of the Ong Family Foundation welcoming attendees. Leticia Peguero (left), of the Robert Wood Johnson Foundation, and Cao O (right), Executive Director of the Federation, shared the successes and challenges of the Project Speak Out! Model. 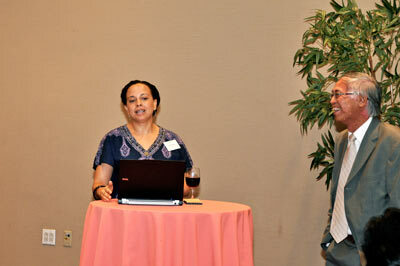 Attendees included: the Beautiful Foundation USA, Taproot Foundation, and Yu Family Foundation. 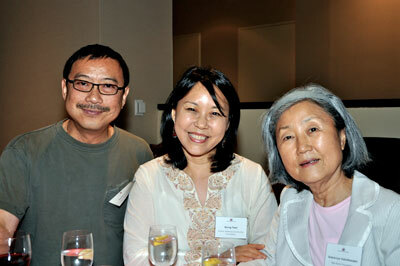 The reception brought together co-host, Paul D. C. Huang (left) of the C. J. Huang Foundation, Kyung Yoon (middle) of the Korean American Community Foundation, and Grace Lyu Volckhausen (right) of the Tiger Baron Foundation. 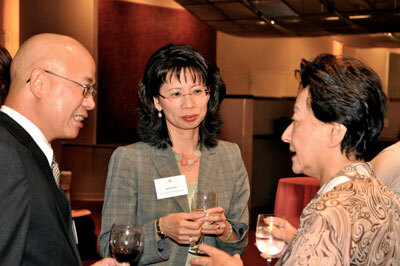 Nelson Louis (left) of the Ong Family Foundation talking with Jenny Low (middle) of JPMorgan Chase Foundation and Marie Lam (right) of the Shau-Wai & Marie Lam Family Foundation. 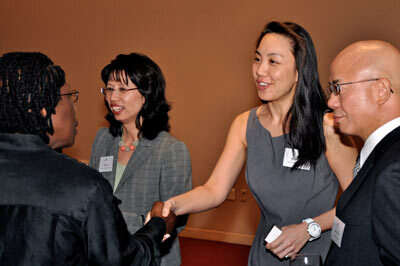 The Federation's Donor Relations Director, Michelle Tong (middle), greeting Patricia White (left) of the New York Community Trust. As local community funders, we hope to establish more efficiency by pooling resources, experiences and funds to our Asian American communities in systematic, strategic and economical ways. We can do much more working together than on our own, and hope to partner with larger foundations and institutions who could potentially work with and match even larger funds. We look forward to continuing a dialogue on how best to serve Asians who are in need. If you have any questions, please contact: Michelle Tong, Donor Relations Director, at michelle.tong@aafederation.org.